According to Jackie Charlton, Managing Director, Captain Cook Cruises - Fiji’s Cruise Line, "Captain Cook Cruises is honoured to have won the AON Fiji Excellence award for the Best Fiji Experience. Our staff and crew continuously strive to provide the best product, service and Fijian experience for our passengers and to win this award is a great recognition of all the hard work by our crew and shore staff. This award also represents recognition of the wonderful and unique product we offer. We work very hard to ensure our three, four, seven and 11 night itineraries are fresh and give passengers the 'real' Fiji experience." Captain Cook Cruises Fiji offer 3, 4, 7 and 11 night cruises around the idyllic Fiji Islands. The three-night Southern Yasawa Cruise offers guests the chance to discover the beauty of the Southern Yasawa Island group including the islands of Waya, Naviti and Viwa and the friendly warmth of its people. The four-night Northern Yasawa Cruise visits the private island of Tivua and cruises the spectacular passage from Yaqeta Island to the Yasawas northern reaches. It also visits the famous Blue Lagoon and limestone caves. The seven-night Yasawa Islands Cruise combines the three and the four night cruises for the ultimate Yasawa Island experience. 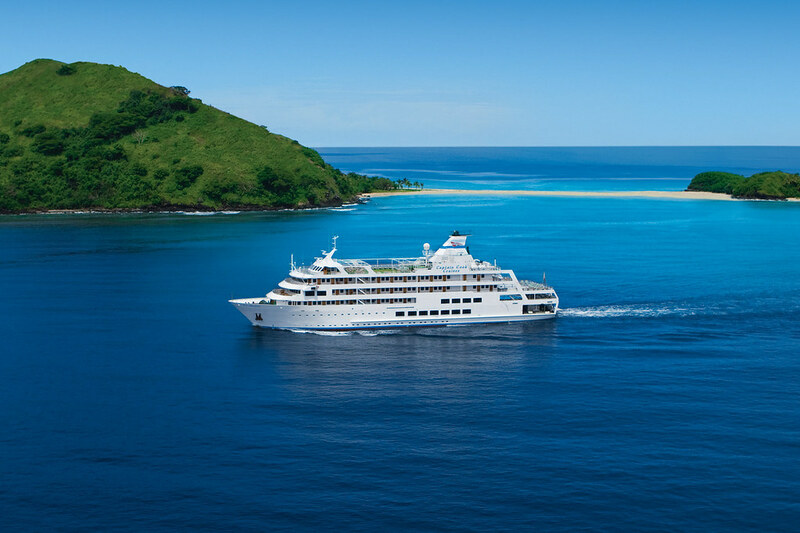 Captain Cook Cruises seven nights Four Cultures Discovery cruise , is the first ever Fiji cruise to circumnavigate Vana Levu, Fiji’s second largest island and visits four distinctive Fijian cultures, Ellice Islanders (Polynesians), Banabans (Micronesia), Fijian and Indians. It also visits the islands of Kioa, Rabi, Druadrua, Labasa Town, Manava Cay and the world’s third longest barrier reef, Kia Island. The seven nights Colonial Fiji Discovery Cruise reveals the unique history, art and culture of the Northern Fiji Islands and allows passengers the ultimate experience of ‘standing’ on the International Dateline. The cruise also visits the islands of Ovalau, Taveuni, Savusavu and Waiyevo. The new eleven night Lau Islands Discovery Cruise explores the lengths of the Lau Islands and Kadavu, a part of Fiji rarely seen by tourists. Invited to visit these incredible islands by locals eager to share their beauty, Captain Cook Cruises worked hard using local knowledge and advice, to put together a fantastic and unique 11 night itinerary. Captain Cook Cruises Fiji previously won this award in 2012 and would like to acknowledge past employee, Eunice Molia, who won the best front-liner of the year.